The work zone crash occurred in June 2010 on a two-lane U.S. Highway where the construction crew was replacing the bridge and approaches to it. 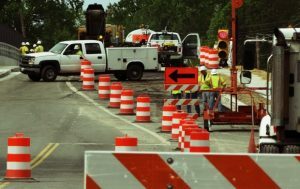 The state Department of Transportation had prepared plans for the project, including traffic control, and had supervisors on site to ensure compliance. Defendant construction worker was operating a Caterpillar motor grader in the northbound lane. Plaintiff, with four passengers in his van, attempted to go around the motor grader by crossing the double-yellow line into the southbound lane. The motor grader then turned left, and the two vehicles collided. Plaintiff suffered a double-fractured jaw, broken leg and bruised lung. Plaintiff filed a personal injury lawsuit stemming from the car accident, alleging defendant construction worker in the course and scope of his employment was negligent in operating the construction equipment, and his employer was vicariously liable. Defendants sought summary judgment, in part alleging plaintiff was contributorily negligent. Plaintiff sought sanctions against the construction company had engaged in spoliation of evidence by repairing the motor grader before plaintiff had an opportunity to inspect it, despite being put on notice of plaintiff’s intent. The judge denied both motions, the case went to trial and plaintiff won, with jurors awarding $3 million. On appeal, plaintiff argued trial court erred in in denying an earlier motion for judgment as a matter of law on grounds plaintiff violated state traffic law by crossing the double yellow line just prior to the crash, constituting negligence per se and making him contributorily negligent and thus (in that state) ineligible to claim damages. Plaintiff argued his crossing of the center line was allowed because the motor grader was in his lane of travel, was not actively engaged in work, had no brake lights, hazard lights or turn signals and appeared to be parked. He also said there was scant indication of a construction zone in place. Plaintiff’s passengers confirmed this, but defendant driver disputed, as did a supervisor for the state DOT, who stated the site did have all appropriate construction work zone warnings in place that morning. Plaintiff’s speed was also a disputed point (he said 25 mph, a nearby construction worker witness said 65 mph). The trial court carefully looked at this evidence, as well as expert witness testimony, medical records and bills in examining whether the trial court had fairly reached a conclusion on both issues of liability and damages. Ultimately, the state supreme court ruled the trial judge’s detailed order indicated no error in the jury’s verdict and defense had not presented evidence that would support their claim for reduced damages. Florida personal injury attorneys in Fort Lauderdale recognize that construction zone accident cases can present more complexities than a typical car accident claim, firstly because they tend to result in greater injuries and there are many different entities – including government agencies – whose actions may be at issue. It’s important to consult with an experienced injury attorney before deciding how best to proceed.